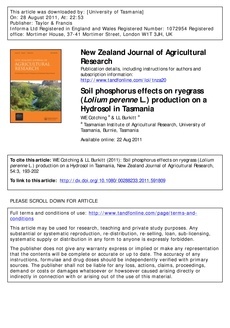 Soil phosphorus (P) concentrations in excess of those required to maximise pasture production impose unnecessary costs on farmers and potentially increase the risk of P runoff to waterways. The relationship between soil available P concentration and pasture production was examined on an Oxyaquic Hydrosol. Mean annual pasture production ranged from 18,415 to 21,834 kg DM/ha over the 3-year sampling period. There was no significant difference in the annual DM production at Olsen P concentrations of 2381 mg/kg measured from the 075mm sampling depth. Results show that there was no increase in pasture production when soil Olsen P concentrations exceeded 23 mg/kg (075 mm). The optimum soil Olsen P ranges determined in the current study are well below the mean paddock concentrations previously measured in northwest Tasmania (54 mg/kg) and suggest that such high concentrations are not justified in terms of optimising pasture growth.